Each EForce Fitness Session will feature three workout templates customized to your fitness goals. Get the guidance and support you need to lose weight, come back stronger from injury, improve your fitness, and gain muscle mass/strength. 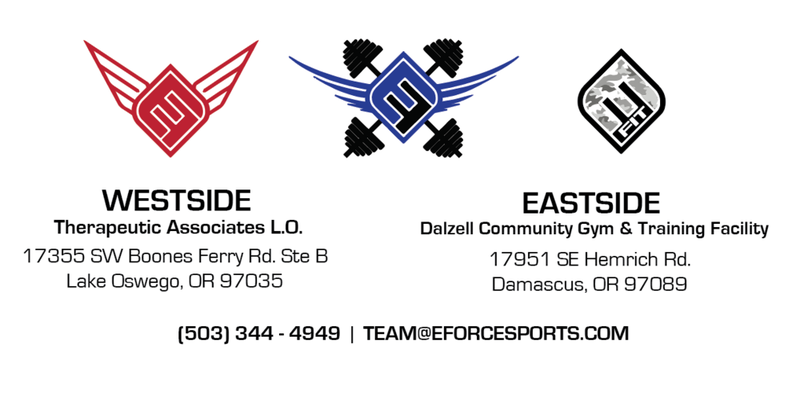 Our EForce Fitness training is run by personal trainers that are educated, experienced, and certified by an accredited sports and fitness organization (click to view trainer bios). Flex Classes, Flex Scheduling, Flex on 'em! No more rushing to make your scheduled fitness class! Register for a 75-90 minute Flex Session and come get your workout anytime during that block. Workouts typically last 50 minutes. Scroll down to view the weekly class schedule and sign up! - Retain or slightly increase muscle mass and decrease fat. “Lean out”. - Focusing on a combination of hypertrophy training for muscle growth/retention and HIIT for fat burn. This class is based on a training technique called Peripheral Heart Action (PHA). It’s based on a superset (back to back exercises) focusing on a move from the lower body, subsequent with the upper body with little to no rest between. (The geeky portion): When a muscle is contracted, your heart pumps blood to the muscles activated! A pooling affect occurs. When you switch exercises from upper to lower, your circulatory system has to work even harder to rush your blood supply to the subsequent periphery! This training technique is tremendously advantageous for every individual, but it has a huge benefit for conditions like high blood pressure! Have it? Train for it! Don’t have it? Avoid getting it! (Non geeky portion): It’s an extremely effective workout!!!! With PHA, you will notice you are more winded! Heart rate is up! Sweat is on! I.e. we get it done!! This class will be a mix of, but not limited to resistance training, calisthenics, plyometrics, HIIT, functional training, TRX, etc.! The magic in this class is in the sequencing! This class will literally cover every muscle group in your body! It is weight based and fast paced! You are in control of your weight selection! Just starting out? Go light and get more rounds! Looking to build? Go heavier and take your pace down! You will be given a time block for one muscle group at a time. Like to sweat? No problem! Your best cardio? Lift weights faster! Your instructor will go over this at the beginning of class, but during your time segment, you will be asked to choose a fitness goal for your workout that correlates with your rep ranges. There is no rest period within each set and we will move quick from muscle group to muscle group! We will have to ask that you please sign up and not just show up with this one as we will have to limit class size, as we will be utilizing the racks, bars and everything else under the sun! SUPER FUN this format! You blink and it’s done! Furthest thing from boring this one!! This class is great for individuals that prefer full body training workouts! This class is great for goal specificities and time efficiency! Even if you got one class a week, this one will leave no man or muscle group behind! An INFERNO for your metabolism! This is a specific type of conditioning that involves weight-bearing exercises, Plyometrics, and calisthenics, targeting every muscle group in your body. It’s crazy effective! When we say effective, we mean challenging! The beauty is you will be entertained by the pace and move variation. 45 min later you are done with your workout: But it’s not done with you! You workout! So you want to look like it, right? This class will guide you through a focus of weight training for specific muscle groups. We will take you through a variation of bodybuilding moves/technique of varying rep ranges for muscle growth. Every class will contain a minimum of two major muscle groups from lower and upper body. Focus will shift from week to week for body symmetry. If you want to see your muscles, attention to heart rate will help! This class has you on that too! Watch out for DOM’s! (Delayed Onset Muscle Soreness). This class is gonna bring it! One of the most sought after goals in fitness is a good solid midsection. The spectrum is broad from individuals that have injuries that can come from a weak core, to others that have a goal of seeing their abs! Either way, to whittle your middle it takes two things. Core work and a caloric deficit. This class includes both. Moves will have a strong focus to the core and although as much as I try, we simply can’t control your calorie intake. So instead in this class you will burn them. A combo of core and calorie burn in the best form. We get it done with HIIT. This class is highly recommended for every individual of every fitness level. Beginners to advanced. Intensity options and modifications provided. We all benefit from a strong core. Make every lift more efficient! Prevent SO many injuries!